Tours are available night and day! With tons of wildlife and a unique island. Guests will experience a piece of Miami they won’t forget. Available day or night. Home of the “#bestnighttimetour.” ™ You can also attend upcoming iPaddle events or explore the bay on your own with our kayak and paddleboard rentals. Tour reservations are required and can be booked online below. Calm relaxing paddle-by-moonlight in Biscayne Bay. Stop on nearby island and enjoy the glow of Downtown Miami’s skyline. 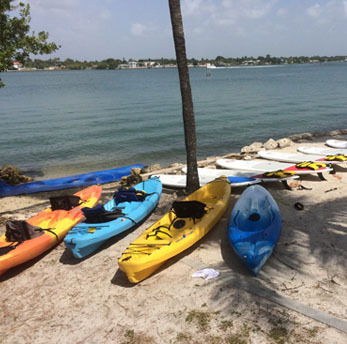 Take a kayak or paddle board on a guided tour of the Biscayne Bay Aquatic Preserve. Explore the nearby island chain and experience a unique urban and natural habitat teeming with wildlife and breathtaking views. Enjoy beautiful Biscayne Bay, the Atlantic coast or the adjacent waterways in a way that best suits your interests (eg. wildlife, fishing, photography, snorkeling, canal/river exploration, extreme beach paddling and more). Create a bespoke event that work colleagues, pupils or members of your organization will remember fondly for years. Kayaks and/or paddle boards, day and/or night, departing from the Pelican Harbor Marina or delivered to your location. We now also offer fully catered options. Team Building | Island Meditation or Yoga | Youth Camps | Staff Retreats | Environmental Clean-up Days | Specialty Area Tours and more …. Contact us now to start planning a special day for your organization!